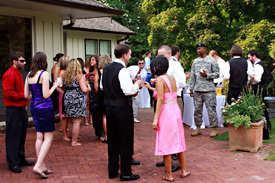 Aldridge Gardens is the perfect venue for your next event! 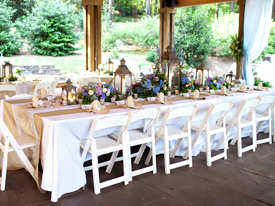 Hold your wedding, reception, or gathering at one of the most beautiful spots in the Birmingham Area. Aldridge Gardens in Hoover is filled with natural beauty no matter what season. In spring, our blooming trees, shrubs, and flowers add a burst of color to nature's background. Snowflake Hydrangeas, and its many other varieties, make their appearance in late spring and summer. Plus, the fall color at the Gardens is breathtaking with reds, oranges, and golds--especially the Ginkgo tree. Even winter can be magical at the gardens with peeling bark and red berries. View the layouts of our pavilion, shade garden, and house by downloading the files below. Then let our staff help you select the right spot for your event. Our goal is to help you make your special day unique and memorable. For additional information and assistance with making your reservations, please contact us.